MultiFeed Server is the ultimate SubServer technology, designed for our Professional Trader, now available for all investors. The MultiFeed allows connecting to your TradeStation 2000i and MetaStock all your available realtime feeds at the same time; expand your point of view around the same symbol supplied by different vendors. Our solution allows comparing the same realtime quotes, provided by two or more different realtime feeds. Now you can verify the Strategies, Systems and Signals by more then one chart updated in realtime, your can decrease the risk generated from incorrect data transmitted from the realtime vendor or not updated chart. MultiFeed Server allows connecting all your realtime datafeeds to TradeStation 2000i and MetaStock. By the MultiFeed Technology you is able to manage all your RealTime Feeds in the same time, collect in realtime all Ticks and Download the historical data provided by your Internet data suppliers. You will be able to use the OnDemand technology for all datafeeds supported. 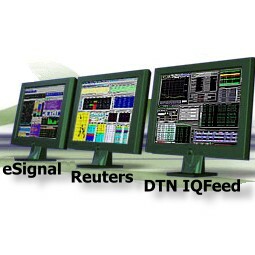 Supported datafeeds: eSignal, QCharts, TalNet, QuoteSpeed, MFSat, XRay, Reuters, Bloomberg, MFSat-Fainex, Mediosim, FutureSource, S&P Comstock, MetaTrader, Excel, Bridge Channel, Whatz.Net, WinBIS, DTN�s IQFeed and any generic DDE. The Trial Version work 30 Min only. Limited Time offer. Valid only until Dec 31. (Yearly Subscription) The regular price is 700 Eur.